This meet will give the Govs an opportunity to see a wave of competitors they can expect to see during next month’s Ohio Valley Conference Outdoor Track and Field Championships—student-athletes from Belmont, Murray State, Tennessee State, Tennessee Tech and UT Martin will be on hand from around the league, with Cumberland, Evansville, Fisk, Freed Hardeman, Kentucky Wesleyan, Lane, Lipscomb, Trevecca, Union (Tenn.) and Western Kentucky also scheduled to compete. After a historic weekend in Bowling Green last week, Austin Peay’s pole vaulters look to add even more height to their respective marks on home turf. Junior Savannah Amato has all but locked up her bid for the NCAA East Regional—at least, as she’s currently 14th in the entire nation—after last week’s record-shattering 4.17m (13-8.25) performance and would love some company from either or, preferably, both Dascha Hix and Morgan Bradley. The latter duo are tied for 40th in the region at 3.87m (12-8.25) heading into the weekend, although Bradley will sit this one out. Thanks to her 12.42m (40-9.00) triple jump to open outdoor season at the Coastal Carolina Invitational, redshirt freshman Maya Perry-Grimes has to be considered one of the favorites in the triple this weekend; she enters competition with the best seed in the field, although Tennessee State’s Cyra Beard and Angel Horton are lurking as challengers. On the track, seven of the OVC’s top 20 100m hurdle runners will pack into the first of three heats Friday; among them will be a quartet of Govs in freshmen Lennex Walker (seventh), Denia Hill-Tate (eighth), sophomore Kaitlyn Black (13th) and freshman Kamille Dunbar (19th). Walker and Hill-Tate will be Friday’s busiest Governors. Walker is scheduled to compete in the hurdles, the 200m dash, the long jump and shot put, while Hill-Tate is down for a team-high five events: 100m hurdles, high jump, long jump, shot put and javelin. Freshman Sabrian Richman will get an excellent test in the 400m, squaring off against not only OVC-leading D’Airrien Jackson of Tennessee Tech but also 2017 NCAA Outdoor Championship participant NaAsha Robinson, also of Tennessee Tech and making her 2018 outdoor debut in the 400m. Another Austin Peay-Tennessee Tech battle to watch will be in the 100m dash, which features the league’s top-two runners in Governor Tymeitha Tolbert and TTU’s Lisa Wickham in a battle for league supremacy. 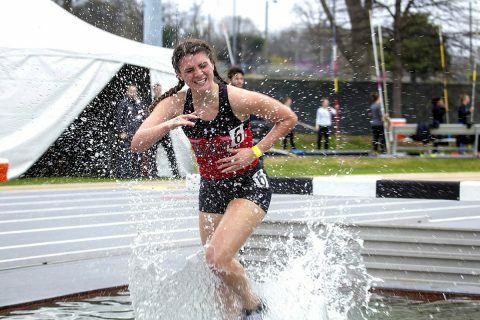 In addition to the meet, Austin Peay will recognize seven seniors—Mathew Biwott, Sarah Carpenter, Gretchen Rosch, Allysha Scott, ReBecca Wheeler, Sarah-Emily Woodward and Ashleigh Woods—for their contributions to the program, with senior recognition scheduled for 1:30 p.m. ahead of the track events. This event is open to the public and concessions will be available at Fortera Stadium. Photos, video and a complete recap will be available after competition at LetsGoPeay.com.